The KWP2000 Plus by GTE Performance - ECU flasher is designed to read and write the flash data stored in the ECU. These stored data are called MAPS that are responsible for things such as injection timing, ignition advance, torque limiter, your speed limiter and much more. You can use this tool with the provided software to read the MAPS and rewrite new data to increase the power of your car and perhaps even for better fuel economy. Please note this product is not for armature, you must be a bit tech savvy. 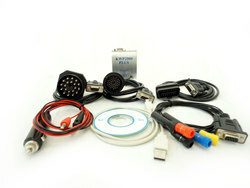 Repair ECUs with software problems or corruption. Requirements to use the KWP2000 PLUS? You need a computer and KWP2000 Plus software included. How to read data from the supported ECU? Save the file to your computer hard disk and edit as needed. How to write data to the supported ECU? Switch off the car ignition and wait at least 10 seconds to complete.